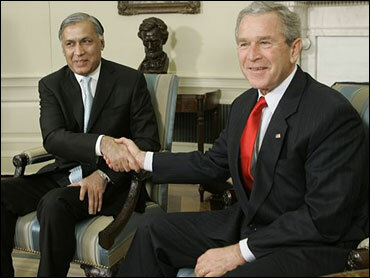 Pakistani Prime Minister Shaukat Aziz said Tuesday he expressed concerns to President Bush about a deadly U.S. missile attack that has increased tensions between the two countries. In an interview with The Associated Press, Aziz said he and Mr. Bush agreed that better communication between the allies was necessary, though they didn't agree on specifics. "We leave it to our officials," he said, adding that representatives of the United States, Afghanistan and Pakistan would meet to discuss the attack in the next few days. "That's the appropriate forum to discuss those issues." Aziz said that at their nearly two-hour meeting the leaders agreed they should improve their coordination "because our objectives are common ... to fight terrorism and build a peaceful environment around us." Earlier Tuesday, Mr. Bush said the United States and Pakistan are working closely to defeat terrorism, but he did not comment on the Jan. 13 American airstrikes near the Pakistani-Afghan border. Mr. Bush met in the Oval Office with Aziz, a visit that comes as many in the Islamic nation are criticizing the U.S. for a Jan. 13 airstrike that was aimed at an al Qaeda leader but instead killed at least 13 civilians, including women and children. "The relationship with Pakistan is a vital relationship for the United States," Mr. Bush said. "I want to thank the prime minister and thank the president for working closely with us on a variety of issues. We're working closely to defeat the terrorists that would likely to harm America and harm Pakistan." Mr. Bush announced that he would visit Pakistan and India in March. Mr. Bush has not said anything about the missile strike in a remote area near the Afghan border, which the Americans say was aimed at Osama bin Laden's second-in-command, Ayman al-Zawahri. He did not take questions when appearing before reporters at the end of their private meeting and ignored shouted inquiries about whether they had discussed the attack. As he was leaving the White House, Aziz also would not talk about their discussions on the airstrike. All he would say is that they discussed every issue between the two countries. Aziz thanked Mr. Bush for assistance that the United States gave to Pakistan after October's earthquake that killed over 80,000 people. He said the area around Pakistan has a lot of challenges, and the country is pursuing peace with its neighbors. "We want to see a strong stable Afghanistan," he said. Aziz has condemned the strike near the Afghan-Pakistani border, saying the United States failed to notify Islamabad beforehand. But during a speech Monday at the Heritage Foundation, Aziz played down deteriorating relations, calling America "our friend and ally." "Whenever our relations have declined, both countries have paid a price," he told an audience at the conservative think tank. "The stability of the region demands a ... constructive, long-term relationship between our two countries." The missile strike has infuriated many Pakistanis. It appears to have stoked support in some areas for the al Qaeda terror group, the leaders of which, including bin Laden, are thought to be hunkered down along the Pakistani-Afghan frontier. Although the attack failed to get al-Zawahri, Pakistani President Gen. Pervez Musharraf said Tuesday there were indications that al Qaeda members were killed. Bin Laden issued a new threat of attacks in the United States in a videotaped message released last week. Analysts have said the airstrike also undermined the goodwill cultivated in Pakistan by U.S. relief in the wake of October's earthquake that killed over 80,000 people. Anti-American rallies in Pakistan are entering their second week.